On Summer Town, Spacecraft provides a deliberate, smooth, sound collage. The music has been created in the hopes of bestowing peace upon the listener. Giles Reaves and John Rose layer synth pads and samples that interact and evolve harmonically with each other while Tony Gerber's plucked guitar accents rise and fade out of the comforting sonic mist. Diane Timmons's vocalize stylings soar beautifully above the music. The result is a gentle and embracing listening experience. 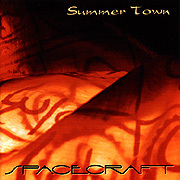 Summer Town by Spacecraft is music for the morning twilight, as the night sky gradually lightens, the stars fade in the daylight and we welcome the brightness of this warm summer day. In the manner that night gives way to day, this music is about slow transitions and the meditative beauty in contemplating the time between day and night - darkness and light. With dawn's serenity comes the fullness of a new day and as with this music, promise and hope.